The Basel Chamber Orchestra I TEMPI has chosen the composer Othmar Schoeck for its second GENUIN CD. The title says it all: Gevorg Gharabekyan and his musicians take us on a dreamlike summer night – all the pieces possess a lightness and cordiality unusual for Schoeck: a wonderful suite, a fascinating cello concerto, and an enchanting pastorale. The string sound of the style-conscious ensemble is supple but captivating. The finest ramifications of late Romantic music are traced. One can only hope that this great CD will contribute to a Schoeck Renaissance outside the Confederation – his music deserves it! "In their forceful playing I Tempi and soloist Christophe Croisé care for a rather big sound." "These are predominantly expressive works, often high on passion and yearning, with occasional forays into a dark and tortured world. 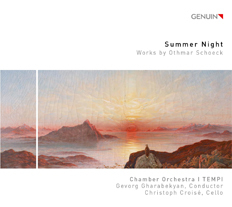 ... Lovers of late-Romantic music looking for something of high quality but out of the standard repertory should not hesitate with this Schoeck album Summer Night."